Kisumu- Know Your Land Rights. Kituo Cha Sheria from 7th to 11th July trained about 60 participants from Kogony and Kanyakwar in Kisumu County. The training was geared towards enlightening the residents on their land rights to enable them understand their land rights in regards to the upcoming Northern By-Pass road construction in Kisumu County that will affect some residents. The participants were taken through the process of acquiring title deeds, doing land transfers and successions. Question 1: What is unlawful eviction? Unlawful eviction means the permanent or temporary removal of persons from their home or land which they occupy against their will without the alternative of suitable forms of legal solutions. Question 2: Who can be evicted? Any person who takes control of land or structures without the express consent of the owner or without any right in law to take possession of such land or structure. Question 3: What are the procedures that should be followed prior to evictions in respect to public land? The National Land Commission is the one mandated with the task of conducting adequate consultations on the proposed evictions with the representative of the affected persons and families. Where an agreement cannot be reached on a proposed alternative among concerned parties, the National Land Commission may constitute a mediation committee comprising representatives of the National Land Commission and the affected families or communities with a view to finding an amicable solution. Question 4: What are the procedures that should be followed before evictions are carried out in respect to private land? If the owner is of the opinion that a person is in occupation of their land without consent, the owner may serve on that person a notice, of not less than three months before the date of the intended eviction. The notice shall be in writing and in a language that is generally understood by the person being evicted. In the case of a large group of persons, it should be published in at least two daily newspapers of nationwide circulation, and be displayed in not less than five strategic locations within the occupied land. Question 5: What next after a person is served with an eviction notice? Question 6: My parcel of land has a 99 year government lease with effect from 1st January 1920 and therefore the term will expire in 4 years’ time. How do I go about to renew or extend the lease? A lease is an interest in land for a specific period of time and subject to payment of rent. Likewise there are also restrictions or conditions imposed by the lessor (land lord) to the lessee (tenant) on what he/she can do with the land. For example in the question above the person holding the 99 year lease is the lessee while the government is the lessor/land lord. In Kenya the government grants leases for land especially in urban areas so as to safeguard community interests and have direct control of the use and development of land. Examples of government lease terms are 33 year and 66 year leases for the former trust land areas – now Community Lands (native reserves in the colonial period). 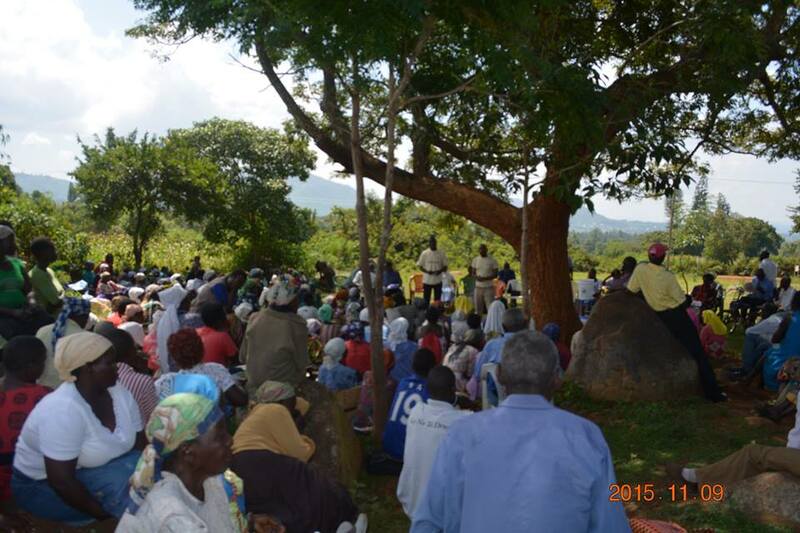 Such towns included Kapsabet, Kakamega, Mariakani, Embu and Kisii among others. In this case one could be given a 33 year term and on expiry of the same they would be added 66 years to make a total of 99 years. However this was on condition that they fulfilled the conditions in the lease in terms of developments and payment of statutory fees like annual rent and rates. The 99 year leases were granted on the former government land (crown land) and examples included towns like Nairobi, Mombasa, Eldoret, Kericho, Nyahururu and Nyeri among others. For such land the government grants a 50 year term on expiry of the 99 year term.However a 99 year extension can be granted if the lessee proves that they will completely re-develop the land by putting up a new approved structure on the land. The 999 year leases were granted by the former colonial government for agricultural farms in government land areas (crown land). Such farms are found in Nairobi and Rift Valley in what was famously known as the White Highlands. The 999 year leases being held by the former colonial farmers were transferred to the Africans who bought or were allocated the farms. However, the National Land Policy recommends leases of not more than 99 years and consequently all such leases are converted by the government to 99 years with effect from 1st September 2010 after the promulgation of the constitution, 2010. Posted on July 23, 2015 October 9, 2015 Categories Access to Justice, Success StoriesLeave a comment on Kisumu- Know Your Land Rights. Kenyan Worker and the Law. Labour rights are one of the core thematic areas that Kituo Cha Sheria operates in pursuit of our vision of a just and equitable society. This has been through legal advice and litigation as well as through policy advocacy and education. Kituo has received numerous complaints from workers regarding their terms and conditions of employment. It is Kituo’s experience that the ordinary Kenyan worker lacks basic knowledge about his or her rights as a worker. Similarly employers are equally unaware of their obligations to their workers. In the year 2007 there was a review of the national labour laws which had been a concern to both the Kenyan public and the Government for a long time. This arose out of tremendous changes experienced in the local labour market such as; structural adjustments, liberalization of the economy and technological innovations. The reviews was aimed at ensuring the laws were responsive to contemporary economic and social changes as well as achieve a new set of reformed updated labour legislation through a coordinated consultative process. The following six (6) core labour statutes were comprehensively reviewed and repealed in that process. 6) The Workmen’s Compensation Act, Cap 236. After that review exercise, 5 new pieces of legislation were enacted. Each Act incorporated the principles of the 1998 ILO Declaration on Fundamental Principles and Rights at Work; thus ensuring the basic human values that are vital to our social and economic development. This month – July, 2015; the government published new regulations that raise the minimum pay for domestic workers in urban centres. These regulations in a legal notice granted domestic workers in Nairobi a 12% pay increase, effectively pushing their monthly salary to Ksh. 10,954 from Ksh. 9,781 last year. The regulations set the minimum monthly salaries an employer can pay a domestic worker in every major town, compulsory weekly off days and overtime compensation. An employer who contravenes the new rules risks serving a jail term of three months or a fine of Ksh. 50,000 or both. The Right to Work is catered for in Kenyan laws. Article 41 in the Constitution of Kenya 2010 on Labour relations and the establishment of the Industrial Court through the Industrial Court Act No. 20 of 2011 with the same status as the high Court, further enforces and guarantees labour rights providing a better environment for pursuing labour Cases. 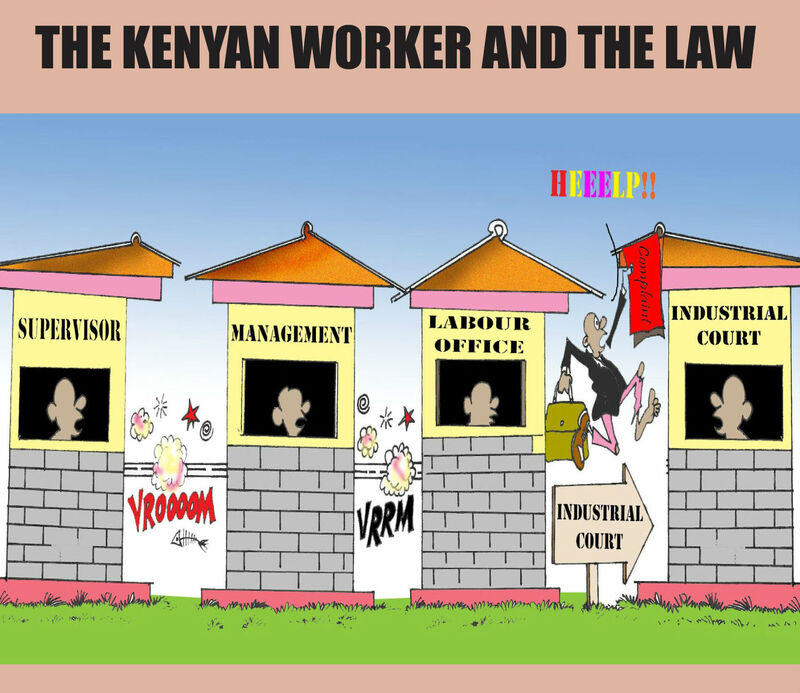 Our publication dubbed #KenyanWorkerAndTheLaw is designed for workers, employers as well as anyone else who wants to know and understand the law in Kenya as it relates to labour and labour relations. Posted on July 16, 2015 October 9, 2015 Categories Access to Justice, Articles, StatementsLeave a comment on Kenyan Worker and the Law. Kituo cha Sheria Turns 42! On Thursday 9, 2015 Kituo cha Sheria turns 42! Our vision still remains a society of justice and equity for all. Our current strategic plan 2015-2019 is themed “Towards Legal Aid, Legal Empowerment and Social transformation”. Kituo Cha Sheria was established in 1973 by a group of young lawyers who saw the need for the poor to access legal advice and justice. These lawyers volunteered their time in the evenings and weekends to provide legal advice, draft briefs and to direct helpless litigants to the respective courts or tribunals. Most of our clients are on one hand poor and vulnerable people living in the urban slums, and on the other hand, poor and marginalized communities from the semi-Arid and Arid lands where communal conflicts and access to justice is limited due to inadequate justice, infrastructure and lack of awareness. Housing, land and labour rights remain a major area of concern in accessing justice and legal advice. Kituo has linked litigation and advocacy together, thereby empowering individuals and communities to demand their rights or seek legal redress. As a result, evictions have significantly reduced and land grabbing does not happen without a fight for justice. Our programs are now linked with advocacy and agitation for policy change. Kituo has been feted for contribution to the development of jurisprudence on access to justice in Kenya with myriad successes including a positive judgment we secured for the right of prisoners to vote in the referendum in 2010 and the 2013 General Elections. We also secured orders in 2012 that the directive by Government to have all refugees confined in Dadaab was illegal and unconstitutional. We also moved to court and got orders on the Muthurwa right to housing case which set precedence for respect of human rights during evictions. KITUO has also defined leadership in the NGO sector through recognition as the Civil Society of the Year (CSOYA) award winner in 2010 and 2012, winner of Transparency Cup of ICJ, in 2012 and to the Law Society of Kenya Justice Cup Runners up in 2013. KITUO won the Distinguished Service Award of the Law Society of Kenya as well as the UNDP AMKENI’s best performing CSO in Access to Justice, in 2014. Internationally, KITUO has won several awards and nominations. 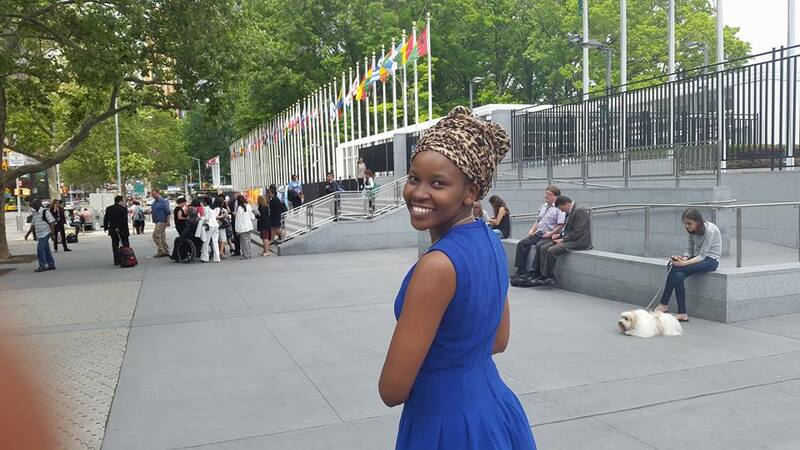 Key among them was the BBC Radio Documentary Award for the paralegal work in Shimo La Tewa Prison (2014), nomination for the Rockefeller Foundation award (2013), nomination for the Innovative Justice Award by the University of Tilburg (HAGUE) and a recent nomination for the Namati Justice Awards (2015). KITUO was also nominated for the Institutional Justice category Award by the East Africa Law Society in 2013. Kituo’s story is however not fully told without a mention of events of the early 1990’s and the challenges Kituo and other civil society organizations operated under. March 15th 1995, was a turning point for Kituo Cha Sheria. At exactly 12:45pm, three men walked into Ushirika Cooperative House, Museum Hill; two of them carrying black suit cases and one man enquired from the guard on which floor Kituo Cha Sheria was located. He walks in and briskly walks out. Minutes later, a loud explosion is heard which explodes into fire burning most of Kituo offices as the attackers sped off using a white salon car. A guard was shot on the leg as they struggled with the arsonists. About eight (8) people were trapped inside the building but they managed to escape. The condemnation of that was widespread with voices terming it as an attack to the thousands of poor Kenyans who needs free legal aid services. The National Council of Churches of Kenya (NCCK) which is one of the oldest Faith Based organization and engaged in advocacy and social justice, provided the physical space for Kituo in our early days as well. Our development partners with whom we share a vision of working towards a society of equity and justice for all and the people who have made Kituo what we are today over the last 42 years have a lot to be proud of. We, therefore, invite all of you who care for justice to journey with us and share your noble ideas, support and resources towards the achievement of the call for legal aid, legal empowerment and social justice. The next frontier in this journey Kituo has worked with and for the poor is technology and innovation to promote access to justice and particularly M-Sheria, a mobile phone based legal aid provision platform; to bridge the gap further in serving the poor and marginalized. In celebration with our staff, partners and mostly the people we serve, Kituo Cha Sheria will carry out a free legal aid clinic on 7th July, 2015 at Kituo Gardens (Head Office) and a Birthday Lunch/Conference at the Laico Regency- Nairobi themed- “Using Technology to Promote Access to Justice” on 9th July, 2015. Posted on July 3, 2015 October 9, 2015 Categories Articles, StatementsLeave a comment on Kituo cha Sheria Turns 42! Can you briefly describe the innovation, in terms of the problem(s) it tries to solve and why is it necessary? This project was mooted in response to the situation where the state only offers legal representation to people charged with capital offenses, leaving out others who are charged with other offenses. This together with the inability of most people in custody to understand the intricacies of the legal system results in miscarriages of justice as well as unnecessary congestion in the prisons. A fair hearing which is a constitutional right can only be possible when there is proper knowledge about the legal process by the persons in custody since majority of them are unrepresented. There is therefore a need for self-sustaining legal aid provision initiatives like this one to be embraced in as many prisons as possible. What makes your innovation unique? This innovation is unique in that unlike most prison legal aid programmes that seek to sponsor lawyers or attach professional paralegals to the prisons; this one targets the beneficiaries themselves to be the drivers and the actors of the initiative. Thus the initiative achieves sustainability with minimal external support. What triggered the development of the innovation? The innovation was triggered by many cases that were being brought to Kituo Cha Sheria about people who were in custody mainly because they lacked knowledge on the legal justice system and thus ended up staying in prison for longer than necessary or even for crimes they never committed. They did not have someone to advise them about their rights and the process in general. Hiring of lawyers was expensive and Kituo Cha Sheria did not have enough personnel hence the need to innovate the prison paralegal project. Which persons and organisations were involved in the development and what role did they play? Although the project was initiated by Kituo Cha Sheria, the prison authorities and the paralegals operate it with minimal technical support from Kituo Cha Sheria. The first stop for every prisoner entering the prison gates for the first time is usually the paralegal office (which is manned by the paralegals) whereby their case is looked into and advice given accordingly. What kind of resistance have you encountered and how have you overcome it? This innovation has not received resistance from the target group – the prisoners. Indeed if it were possible, they all want to be paralegals! However, the project has been slow to replicate since the prison authorities are firm believers of status quo and sometimes view the project with scepticism. How did you make the goals realistic and attainable, and when will quick wins be available? Shimo La Tewa is the best practice of this project and has run for the last five years and gets better every year. As a prototype, the initial idea was to target the prisons that have large numbers of inmates. It was realised that it was necessary to consider extending the project to women’s prisons although they do not hold as many inmates as the men prisons. Later on we encouraged the collective justice advocacy of issues affecting the prisoners which translates to developments in the legal system. A case in point is the landmark case on prisoners’ right to vote, the ongoing challenging of the death penalty and the discrimination by the sexual offenses act on the basis of gender. Will the innovation affect other organisations in the chain and if that is the case, how will it affect them? The innovation could be perceived as taking over criminal lawyers work…but that aside this innovation could be the break-through for organisations that provide legal aid and have the mission to promote access to justice. How was the development funded and what were reasons for the financing organisation? Initially the project was not funded and advocates volunteered their time and expertise to work with the paralegals until UNDP- Amkeni Wakenya came into the picture and provided a grant to capacity build the paralegals, equip the justice centre and initiate the process of replication of the project in two other prisons. Can you name 3 to 5 characteristics of the innovation that are most essential to make it work? Volunteerism – by the paralegals and volunteer lawyers to the program. Self-sustainability- because of the minimal costs involved. Collaboration -with the prison authorities. 10.How do you measure whether it is a successful innovation? Monthly reports on the number of inmates given advice, appeals launched, applications made, letters submitted to the courts. We also track the number of acquittals, discharges and reduced sentences. Each paralegal has a record of the number of cases they have handled and their outcome. This number is used during the Prison Paralegal of The Year Award to appreciate the most hard-working paralegal in the prison. How many people or organisations benefit from this innovation now? The three prisons benefiting currently from this innovation host a population of about 5,000 inmates but this is just the beginning. How many people or organisations could potentially benefit your innovation now and in the future? Can or will the innovation be used internationally and how do you overcome cultural differences? This innovation could be reflected in all 93 prisons in Kenya which host over 55,000 prisoners currently (this is the number in penal institutions including pre-trial detention). Since the project is confined within the prison environment, it has no potential aspect that could bring about cultural clash. Can you quantify the financial benefits? This project is institutionalized within the prison so it saves costs for accessing legal aid for prisoners and also minimising the operational costs of organisations/entities supporting such initiatives – mostly minimal technical assistance is needed. Is the innovation financially viable and sustainable and if yes, how? This project is financially viable and sustainable since it blends in and becomes part of the numerous undertakings in the prisons – this is together with the vocational and formal education programmes run in all prisons in Kenya. The innovation has become one of such undertakings in the prisons. 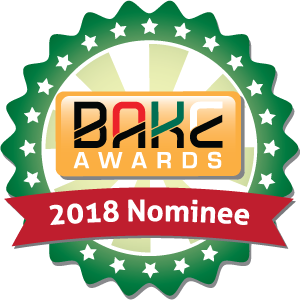 Did you receive any recognition? Our project has been recognised by the President of the Supreme Court (The Chief Justice) of Kenya as one of the indicators of the fact that Kenya is moving towards the right direction in access to justice. What lessons did you learn along the way that could be useful to others? It is wise to have inmates serving longer sentences to serve as paralegals since the knowledge and skills required for this type of confined paralegalism is perfected with time. Getting an acquittal is not an end to itself and therefore there should be a follow up after prison and integration programme for former prisoners back into society. This is a challenge we have been grappling with as supporters of this innovation. This interview with Jackline Mwende from Kituo cha Sheria-Legal Advice Centre first appeared on “Reinventing the Rules” Blog and provides great insight into the unique ways paralegals are providing legal aid to prisoners in Kenya.